John David Kasay (born October 27, 1969) is a former American football kicker in the National Football League. He was drafted by the Seattle Seahawks in the fourth round of the 1991 NFL Draft. He also played for the Carolina Panthers, and New Orleans Saints. He played college football at Georgia. Kasay attended Clarke Central High School in Athens, Georgia, where he was a soccer stand out and football kicker/punter He was an all-state selection with 37 career field goals, including a 54-yarder. As noted in the "Categories" at the end of this page, John is an American Christian. Kasay graduated from the University of Georgia in 1991, and was drafted in the 4th round in 1991 by the Seattle Seahawks. During his tenure, he led the Seahawks in scoring all four years, and left the team with the highest field goal percentage in team history. 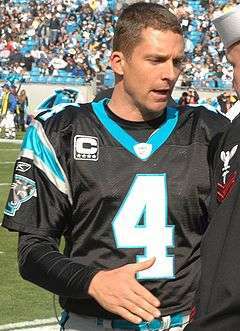 The Panthers signed him as a free agent prior to the team's debut in the 1995 NFL season. He played for the Panthers in 15 seasons, but missed the whole 2000 season after breaking his left kneecap in August. Kasay continued to play for the Panthers through the 2010 season. On July 28, 2011, he was released by Carolina after they signed Olindo Mare. Kasay was the last remaining player left from the Panthers' 1995 inaugural season. The New Orleans Saints signed Kasay on August 30, 2011 after an injury to their starting kicker Garrett Hartley during a preseason game. According to Al Michaels during the Thursday Night Football broadcast against the Green Bay Packers on September 8, 2011, Kasay was at a "back-to-school" event when he received a phone call from the Saints wishing to sign him. Kasay played out the 2011 season in New Orleans, and was resigned through the 2012 NFL season by Saints on April 26, 2012. However, he was released by the Saints on August 31, 2012 with the return of Hartley. Kasay formerly held the record for most field goals in a single season with 37, which he achieved during the 1996 NFL Season, and he was awarded his only Pro Bowl appearance as a result. His record was broken three years later, however, by Olindo Mare, who booted 39 field goals. That record was later broken by Neil Rackers, who made 42 field goals in 2005. That record was later broken by David Akers, who made 44 field goals in 2011. Kasay holds virtually every Panther kicking record, and is also the all-time points leader of the Panthers. ↑ Cobbs, Matt. "A team of destiny", Athens Banner-Herald, October 14, 2005. Accessed November 27, 2007. ↑ Larry Holder, "Former New Orleans Saints kicker John Kasay to sign, retire with Panthers", Times-Picayune, May 7, 2013. ↑ "Storify: John Kasay's retirement news conference". Charlotte Observer. May 7, 2013. Retrieved May 7, 2013. ↑ Person, Joseph (May 7, 2013). "John Kasay retires as a Panther". Charlotte Observer. Retrieved May 7, 2013.